Tempe, AZ, WPH Press, 4/3/17- JR WPH headed 100 miles west of its headquarters in Tucson to host an exciting collegiate handball clinic with the Arizona State University Handball Team. 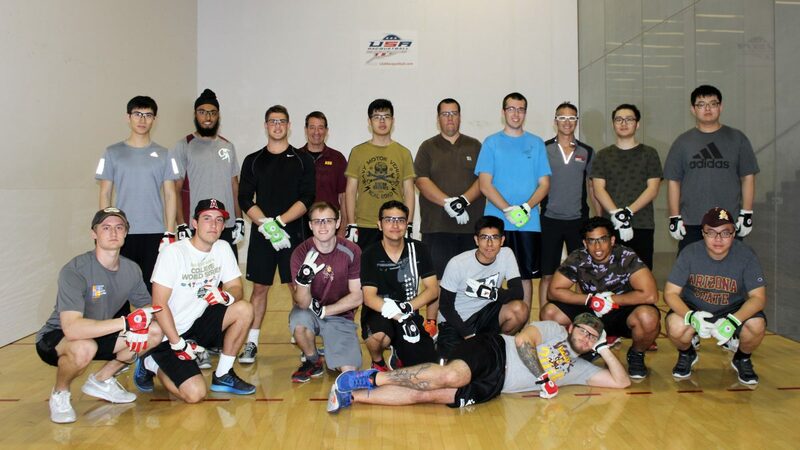 16 collegians, ranging from “A” players to beginners, took part in the clinic that focused on the proper handball warm-up, fundamentals, drills, diet, and cross-training exercises to improve their handball abilities. Thank you goes out to ASU head coach and handball pioneer Dan Willeford for all he does for Arizona State University Handball. Check out the Around the Globe from Tempe that discusses the ASU clinic and previews the 2017 Salt Lake City Aces Player’s Championship April 21-23 (Below by Clicking the YouTube Pic). Also, do not forget to get involved in the Save the ASU Handball Court initiatives going on right now.